All introductions are limited and available on a first come first serve basis. 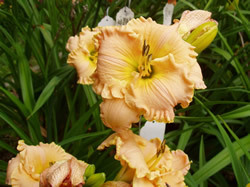 When we receive your payment, the daylilies are yours, and we will send you an email confirming your purchase. Our plants are guaranteed true to name and to be at least a blooming sized single. We ship on Monday or Tuesday of the third week in May and will advise you of the shipping date by email. Please include 10% for Express post shipping (a minimum of $7.00) and if you live in Ontario, the HST. If you live in the Ottawa area, you may avoid postal charges by picking up the plants. We have daylilies of other hybridizers should you wish to buy them and add them to your purchase of our plants.